This article focus to discuss on Prokaryotic Cells. 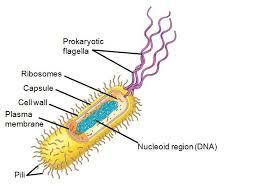 Some prokaryotes have various shapes and sizes and are considered to be pleomorphic. Rickettsiae and mycoplasmas are degrees of pleomorphic microorganisms. When a number of prokaryotes divide, they cling to one another in a distinct layout. A diplococcus, for example, consists of a set of two cocci, while a streptococcus consists of a chain of cocci, plus a tetracoccus consists of four cocci arranged in a very cube.